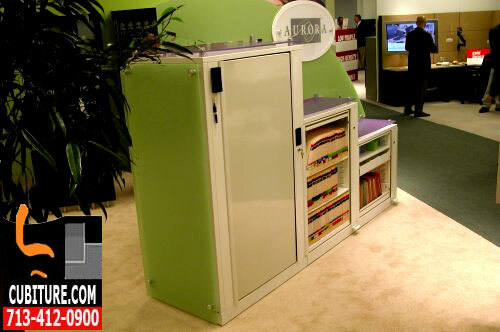 Office storage and filing systems organize more in less space. 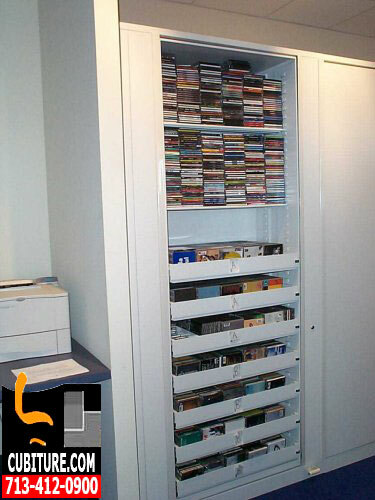 Consider what needs to be organized in office storage units. Your storage requirements will be based upon your industry. In addition to hard copy documents, you will need to store equipment and supplies specific to your organization’s process flow. For example, if you are working in education, you will need to store a wide range of school supplies that classroom teachers use on a daily basis. If you are working in medicine, you will need to store lab equipment, medication, and medical equipment. Most organizations share a common need to store basic office supplies and I.T. equipment. While most forms of paperwork can be stored in a filing systems of some sort, other materials will require special cabinets/shelving systems to be properly organized and accessed. In order to save customers as much space as possible, Cubiture offers both high density filing and high density shelving systems. 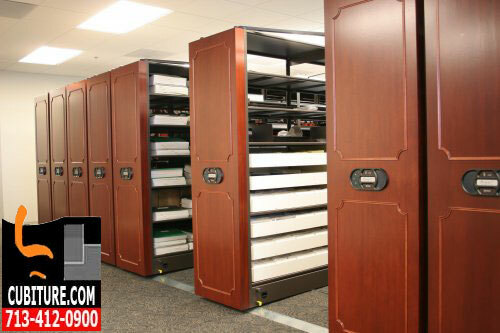 These units offer up to 3 times as much storage capacity in less than half the physical area required for standard shelves and vertical file cabinets. Once you have made an assessment of what you need to store, and what types of office storage you need, you then have to think about finding solutions that will consume as little physical floor space as possible. Obtain a free office layout design drawing. This is where office space planning comes into play. One of the most important services that Cubiture offers is free, complimentary site planning. By taking the basic parameters of your floor plan, and specific measurements of individual work areas, we can develop an office design layout drawing that will show you where your office furniture will be placed in relation to your workflow. 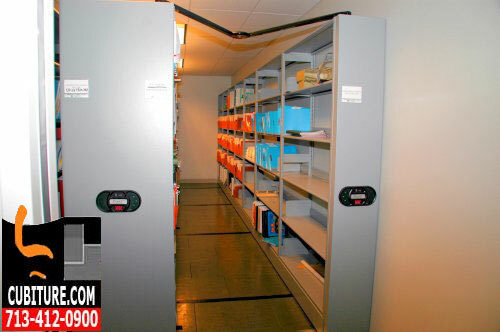 This is very important because many of our casegoods and cubicle systems feature built in storage and filing systems. Other systems allow room for compact filing an storage units to be placed under work surfaces, or at the ends of desk. Mapping out these systems first enables us to know exactly what you can store in individual workstations and what you will need separate office storage units for. Consult with Your Space Planner about Where to Place Storage Units. Once these determinations are made, you are now in a position to look at products that are dedicated specifically to helping you efficiently organize paperwork and supplies. Cubiture has many lines of specific product types to meet your requirements. The ideal office storage solutions involve not only finding the right office filing furniture but implementing the best office shelving solution, in conjunction with a records management solution that will suit your organization’s needs. 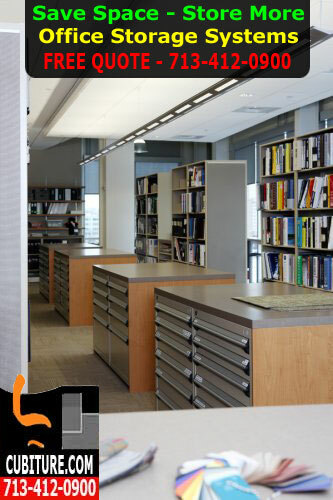 We have a number of office shelving systems that combine mobility, aesthetics, and high-density capacity. 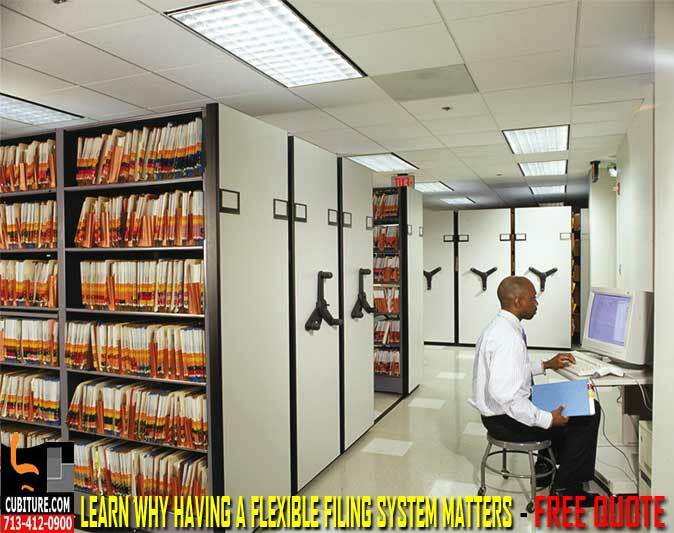 We have many types of lateral filing systems as well that offer more room, and quicker access, than vertical file cabinets. Still other models include rotary filing, compact shelving, mobile shelving, wire shelves, and models made from recycled steel that contain no VOCs. Applications for office storage and filing products range from law enforcement to healthcare to industrial and office environments. AU-870 High Density Filing Systems Sales & Installation Services Houston, Texas - The story is different for files that are frequently accessed. Cabinetry for frequently accessed files should generally be of higher quality, and drawers that roll on ball bearings are worth the investment. Au103 Rotary Filling System Sales, Design & Installation Services.